*ADA Reservations Policy: Due to limited available seating in our ADA area, we limit reserved seating to two persons. You may reserve seats in our ADA seating area for yourself and one companion who is providing assistance. For persons in wheelchair accessible seating, your companion must sit directly behind you as there are no regular seats in this row. Everyone else in your party must sit in the general admission area within the level they purchased. If you have multiple persons in your party with mobility or special needs, who are requesting ADA seating, you will need to make a separate reservation under each persons name. The Will Call and the Box Office are two separate entities. If you purchased your tickets online or over the phone through Paranormal Cirque or paranormalcirque.com, your name will appear on our WILL CALL list, and you will find that list through the front entrance of the first tent (the tent with two points on the top). Will Call will ask for ID. If you purchased your tickets through any other ticketing service, you will come to our BOX OFFICE to receive your tickets. Please present your ID. HELP! I CAN'T PRINT MY TICKETS! No worries. As long as you received either an email confirming your purchase, an email of your receipt, or a confirmation ID number from Paranormal Cirque, all you have to do is present your ID at Will Call, which is located at the front entrance of the first tent. PLEASE NOTE! If you purchased your tickets from a DIFFERENT ticketing server and cannot print them, we will search for your name on a list that we will have at the BOX OFFICE. Please present your ID. RESTRICTED - under 17 requires accompanying parent or adult guardian over 21 with a valid photo ID. You must be at least 17 with a photo ID, which includes your birth date, to purchase a ticket for yourself for this show. All patrons under the age of 17 must be accompanied by an adult 21 years of age or older. Photo ID is required for purchasing tickets or at the entry of tent at the discretion of Paranormal Cirque. Ages 13-17 are welcome but at the parent's discretion. This show has adult language and material that is not intended for ages under 17. No costumes or mask allowed! If there was a 16-year old wanting to attend, he or she would require an adult or guardian over 21 to purchase a ticket and attend with the patron. If there was a 17-year old with NO PHOTO, he or she would be required to have an adult or guardian over 21 to purchase a ticket and attend with the patron. If there was a group attending and one person does not have a Photo ID, he or she would require an adult or guardian over 21 to purchase a ticket and attend with the patron. Under 13 is not permitted. Ages 13-17 are welcome but at the parent's discretion. This show has adult language and material that is not intended for ages under 17. Does Paranormal Cirque offer any Senior, Student, or Military discounts? 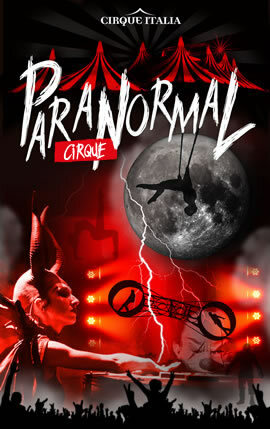 There is no difference in the cost of the ticket… Paranormal Cirque offers the same price for every adult ticket. Is there a discount if you purchase tickets as a group? For groups of 25 or more adults, Paranormal Circus would love to accommodate you. Please give us a call or send us an email to inquire about a special discount and any requested accommodations. PLEASE NOTE: Discounts or coupons offered from Paranormal Cirque CANNOT be combined with offers or discounts offered from a DIFFERENT ticketing website or location besides Paranormal Cirque , and CANNOT be combined with complementary Paranormal Cirque tickets awarded from various locations.